my mom + wine = spillage. Well that, and that my mom prefers whites. But mainly the first reason. 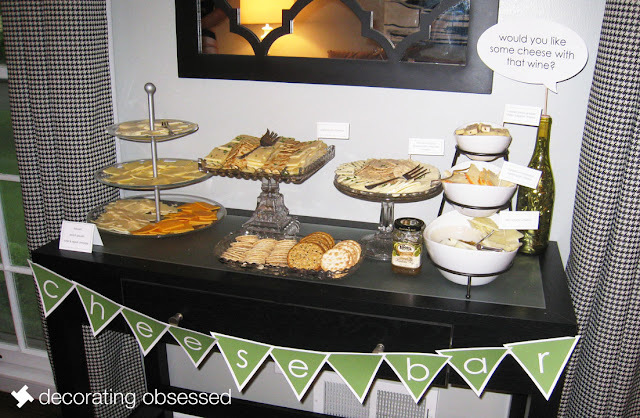 I love green wine bottles – so I used that to set the tone on everything I did. 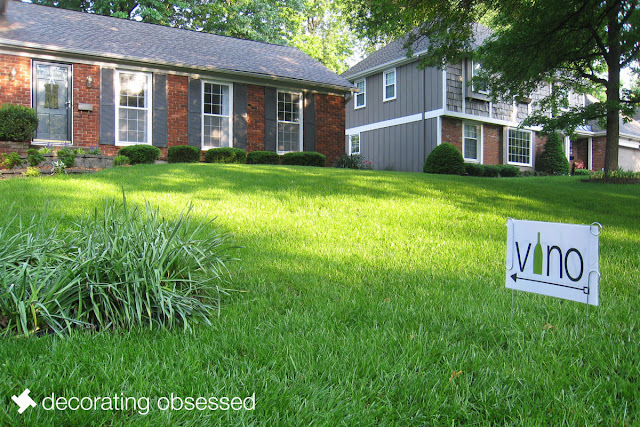 Since most of my mom's friends haven't been to my house, I wanted a sign out front. (Well, I would have made a sign no matter what, but at least this time around I had an excuse). 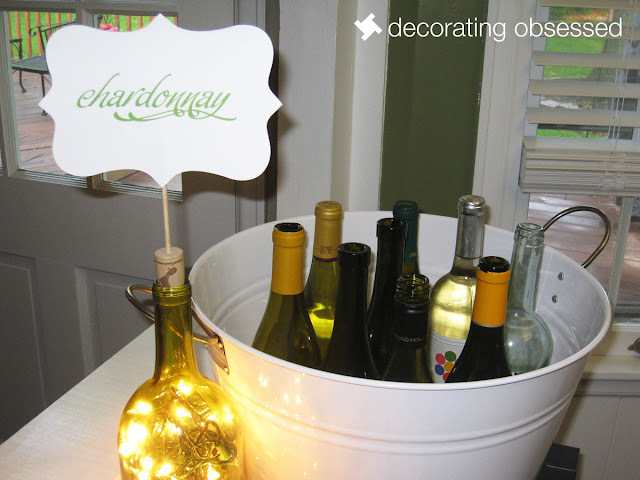 We had four different stations set up around the house – chardonnay, pinot grigio, riesling/muscat and blends. 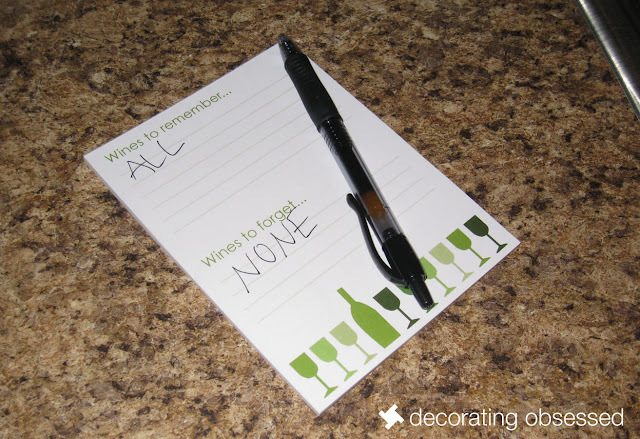 Aside from wine, each station had a wine opener, notepad, pen and napkins. I designed the notepads, and then had them printed at VistaPrint. 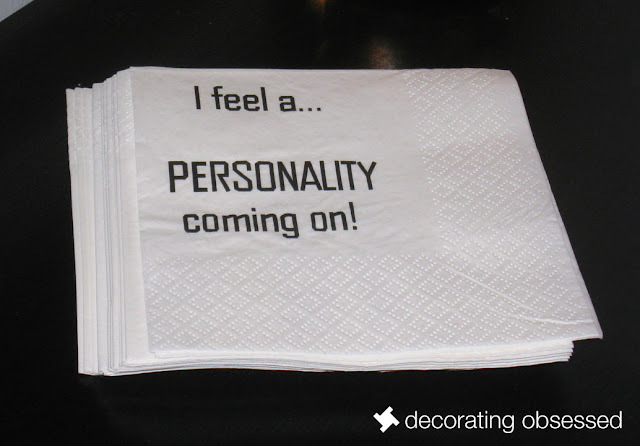 Originally, I was going to get napkins with wine phrases on them, but when I saw these, I just couldn't resist. For the station bottles, Brent drilled a hole in each one then we stuffed Christmas lights in them. (Just a warning – after 5 hours of being on those bottles got super hot, so we turned them off). As for the top part, I used a Silhouette. We also had beer on tap for the non-wine drinkers. Brent and I definitely underestimated that amount of people we had in that group. The pony keg was finished off in about 4 hours, then that group moved on to mix drinks. 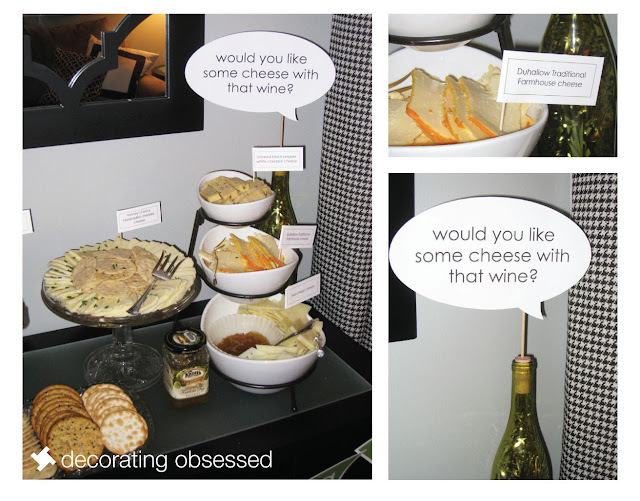 Wine and cheese – it's a match made in heaven, so of course a cheese bar was a high priority for me. There were 9 different types of cheese, 3 different crackers and some fig spread, which went great with the Manchego cheese. 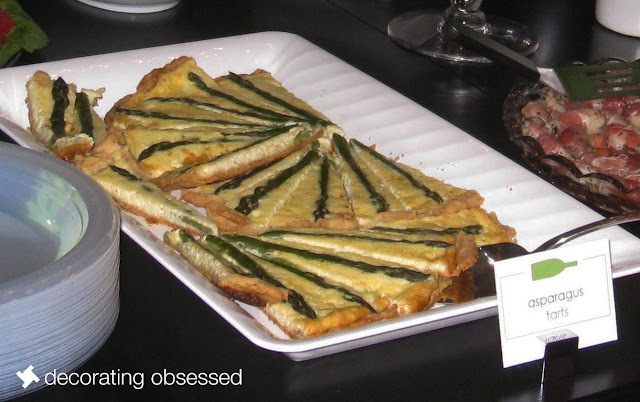 I love appetizers at a party, and I can't see myself ever breaking away from this. Some of my mom's friends helped me out and brought appetizers as well, which made getting everything ready on Saturday so much less stressful. 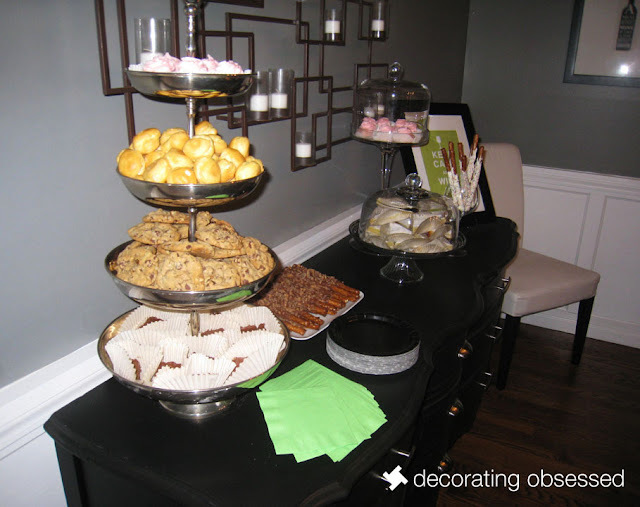 The menu: Grandma's cream cheese brownies, cream puffs, lemon bars, pink champagne mini cupcakes, my mother-in-law's chocolate chip cookies with walnuts, chocolate-covered pretzels with heath bar and white chocolate-covered pretzels with sprinkles. I wanted to display pictures of my mom without making a huge production out of it (my mom would not like a picture wall). 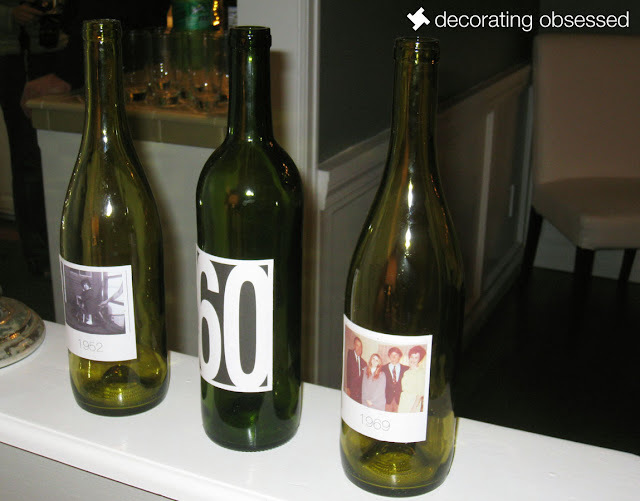 So, I cleaned off some wine bottles, created picture labels and placed them throughout the house. I thought the party turned out great, but most importantly, my mom had a blast. 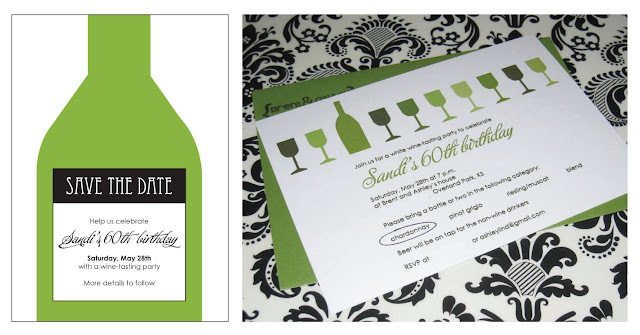 I hope to have the wine-party paper package available soon! Wow...this is just spectacular!! 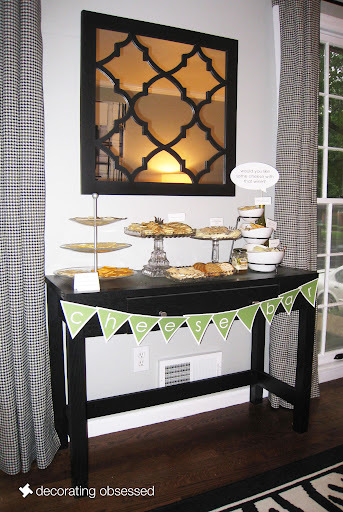 So many great touches and I love the wine and cheese theme...OH and the asparagus tart is awesome!!! Nice job! Ashley, it's amazing!! Totally fabulous. Ashley, I love this. When you make your package, will you do one for reds as well? 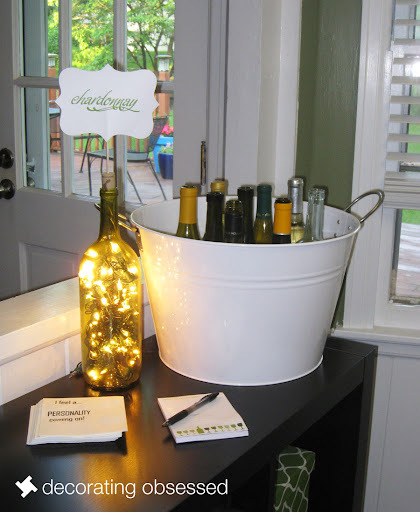 Hint for the lit wine bottles: use LED christmas lights. Looks like this party was a huge success! 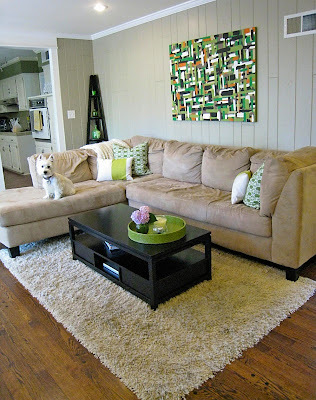 You are one amazing decorator, planner etc. You have really thought of everything here. I will be keeping those antipasto kebabs in mind for our next gathering. Love it all!! I just discovered your blog. I totally love your party ideas. great idea! any tips on the picture labels? 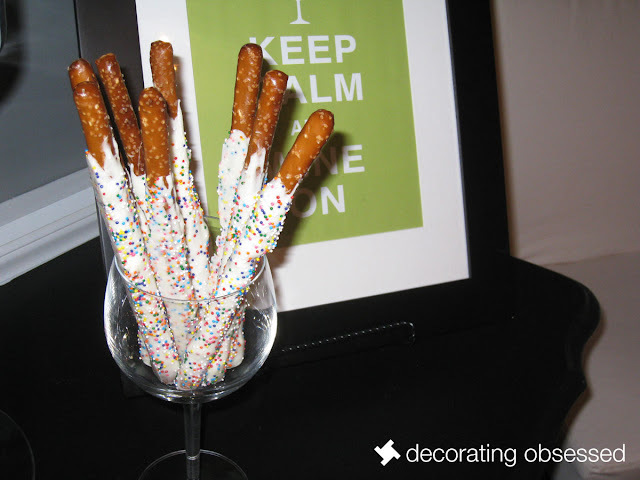 My mom is turning 50 in about a month and I am planning on a wine-themed birthday bash! LOVE all of your labels! 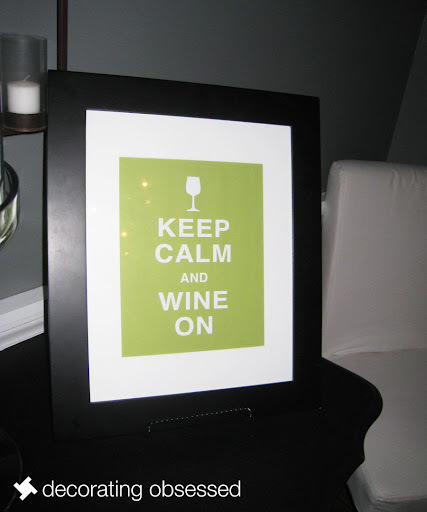 Your layout and the "Keep calm and wine on" really gave me a lot of great ideas! Thanks so much!!! I LOVE THE LOGO THAT YOU HAVE ON YOUR INVITATIONS. WHERE DID YOU GET IT FROM?